What the New York Times once referred to as “a blend of Polynesian kitsch, fake island food and lethal rum drinks” first reached Louisville in 1959. That was when the Luau Room landed at Standiford Field (now known as Louisville International Airport). The Polynesian restaurant craze had just about reached its peak after beginning in the late 1930s with two outsize personalities who both claimed to have invented the Mai Tai: Don the Beachcomber and Trader Vic. “Trader Vic” was the nickname of Victor Bergeron, a California native who ran a San Francisco bar that became increasingly cluttered with and identified by its South Sea Islands bric-a-brac. Don the Beachcomber was originally Ernest Raymond Beaumont Gantt, a New Orleans native who arrived in Los Angeles and created a bar based on rum drinks because it was “the least expensive of the spirits,” inventing exotic-sounding names such as the Sumatra Kula, Zombie and Missionary’s Downfall. The bar became so popular Gantt legally changed his name to Donn Beach, and his restaurant empire began to rival that of “Trader Vic” Bergeron. As America’s thirst for rum drinks and “Polynesian” inventions such as the pu pu platter and rumaki, Louisville’s airport decided to upgrade its full-service restaurant. Dobbs House, which held the concession for the airport restaurant, installed a version of its Luau Room in 1959. The menu offered the typical slate of “Polynesian” dishes, many of which seemed to have been taken from the nearest Cantonese restaurant: sweet and sour pork, chicken chow mein and egg rolls. There were also live lobsters and dishes “with an American touch” including steak, beef skewers and barbecued ribs. The Luau Room also had its selection of exotic drinks. 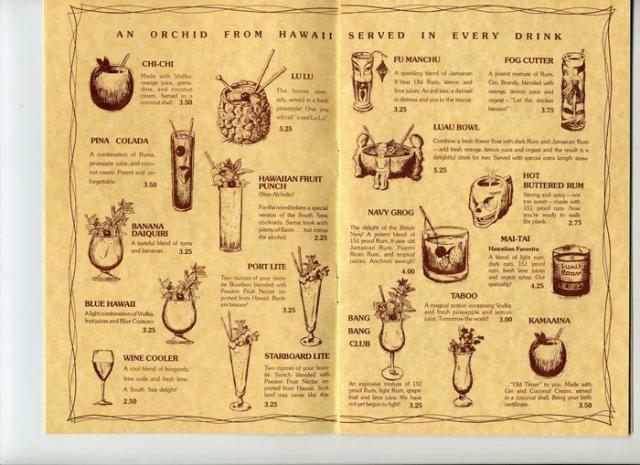 Patrons could order a Fu Manchu, Fog Cutter, a Luau Bowl or a Mai Tai and would get “an orchid from Hawaii” in every one. 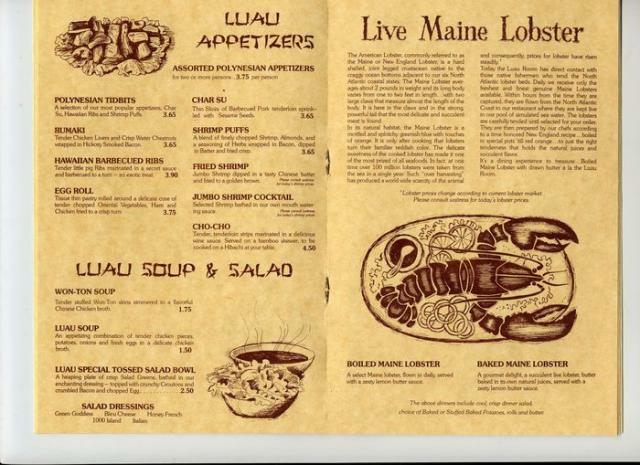 In addition to returning the decor, Ferguson brought back the Luau Room’s menu, along with chef Rufus Wright who had been at the airport location “for 13 years.” Ferguson predicted that his restaurant would see “a new crowd of patrons in just a short time,” citing “proximity to downtown” and being “a straight shot from Churchill Downs” as reasons for optimism. It seems that Louisville’s liking for tikis and exotic rum drinks had come and gone, despite Ferguson’s best efforts. The Luau Room only lasted for a few more years, closing sometime around 1990. Some ephemera from this Polynesian palace still remains, with rumors of the entire Luau lot surviving in a warehouse somewhere. But as of this moment there are no Polynesian restaurants left in Louisville—though a somewhat similar (yet more modern and Mexican) tiki vibe still exists at El Camino. I have a matchbook collection of louisville restaurants from ca1976-1985. The fig tree, Myra’s, Casa grisanti, etc… Do you guys have a physical location where such a thing might be welcome? That is super cool, but we don’t have any need for them now. Wish we’d known when we were writing the book! I just sold three glasses from the restaurant!1 Cool article!